His decision was final. I was 12. I thought about this for an unnecessarily long time. Do I really still have a baby face? That kid could not have been taller than four feet; there was no logical way he thought I was only four years older than him. But that’s the beauty of being a kid. Step-by-step logic and linear thinking have yet to be ingrained into us. We have no concept of social constructs, like what it means to be “young” or “an adult.” We haven’t been socialized with norms, constraints and biases yet, so we aren’t constrained to operate within them. We enter Dartmouth with empty cups and open minds, easily impressionable and eager to learn. Slowly, we pick up the lingo, become familiar and begin to build a box around ourselves out of bricks of well-known identifiers: Class year. Affiliation. Sports teams. Social groups. Extracurriculars. We define ourselves in ways that can leave little room for exploration. Our cups get filled. I remember that when I was a freshman, the upperclassmen whom I considered mentors talked about “being jaded.” I always thought to myself, “There’s no way that’ll be me.” Fast forward a couple of years (and many consecutive on-terms) to my junior fall and, lo and behold, I felt jaded and burnt out. I was stifled by the repetition of on-nights that seemed to blur together, cynical about Greek life, bitter about my friends’ experiences with sexual assault as well as my own, tired from self-imposed pressure to be “on” all the time, stagnant in my own routine and trapped in the middle of the woods. I felt stuck emotionally, as though my identity at Dartmouth had become solidified into a presentation of myself to others that no longer matched how I viewed myself and the ways I had changed and grown. I tried to escape by going off campus every weekend. I would dread returning. One of the bright spots of that term was taking ENGS 12, “Design Thinking,” which required me to overcome the apprehension of trying a class that was very different from previous courses I had taken. It was a lot of “firsts” for me. For instance, it was the first time I had used Adobe Photoshop. It was also, unsurprisingly, the first time I had nearly pulled an all-nighter to build a foam rollercoaster. Design thinking ­— a reiterative process that is centered on user needs and focused on creative problem solving through empathy, user research and rapid prototyping — was a foreign concept up until that point. But, within the first week, I decided to pursue Dartmouth’s human-centered design minor. So much new information was thrown at me, but many of the principles we learned and practiced easily transcended the class and filtered into my own life. I found myself naturally beginning to reframe “failures” as opportunities for growth — the earlier I failed, the faster I could improve. The observational nature of user research translated into mindfulness in my own day-to-day existence. Throughout the term, we kept journal entries of “the beautiful” and “the unexpected.” Even small moments carried weight, like finding exactly what I needed at Jo-Ann Fabric or holding hands on the Green during the farmer’s market. One of my favorite lectures touched on “the beginner’s mindset” in the design process. I truly did feel like a beginner in this class. But the message of the lecture was to hold onto that fresh lens, even after becoming more experienced. It emphasized listening, deferring judgment, curiosity and playing the “Why?” game that kids do to annoy their parents. I realized that being a beginner meant acknowledging and shedding the cognitive biases, habits, preconceptions and complacency that restricted me. It was freeing. Fast forward to now: senior spring. I’m in my second and final term of the Senior Design Challenge, a two-term capstone experience that was created for seniors to use everything they’ve ever learned, human-centered design-related or otherwise, to work with a team to help partner organizations (or “clients”) create solutions for their challenges or problems. Most of our partners are from the local community in the Upper Valley and focus on promoting health and wellness and empowering their target populations. Although the Upper Valley is racially homogenous, it is socioeconomically diverse, creating many opportunities for community engagement and social impact. All we have to do is look beyond our bubble to see the exciting work within these organizations and be reminded of how important and unique the community is around and beyond our campus. It initially (and still does) feel like a daunting task. There’s a constant level of ambiguity that each team navigates as it works to design something that four, eight, 12 weeks ago was entirely unfamiliar. But even that, as uncomfortable as it may sometimes be, is exciting. My peers and I, as complete novices, have the opportunity to learn and discover implicit needs and have the freedom to brainstorm wild ideas and break away from established, institutional status quos. But as we become more familiar and experienced on our projects, we continue to integrate a beginner’s mindset by opening ourselves up to the gift of constructive feedback and offering fresh perspectives. I am incredibly lucky and grateful to have these peers, who, at the end of the day, make the Senior Design Challenge what it is to me. I hope that, wherever I end up in the future, I can find — and if not find, cultivate — a similar environment where I can share moments of being ridiculously weird, and where everyone supports and pushes each other’s creative boundaries without judgment. I know this sounds like a huge plug, but I promise I am not being endorsed by any entity other than my own sentimentality. 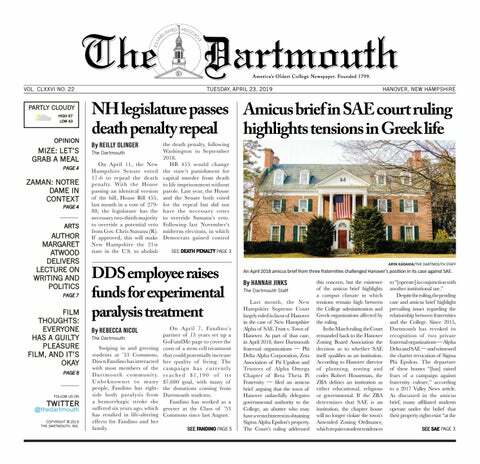 From these experiences, both with and beyond human-centered design, I’ve learned to see Dartmouth with fresh eyes again. Sure, it’s been a while since I matriculated. Heorot highlighter party is long behind me. But, I feel just as present as I did four years ago when I toured campus and stood in the middle of the Green staring at the lavender face of the Baker Tower clock. I try to stretch out and savor every moment with my friends. I enjoy the time I have alone to sit by the window at 3 a.m. and listen to the rain. Graduation is exciting. It’s sad. It’s scary. The way that I feel about graduating shifts on an hourly basis. This place has given me so many memories, many that I want to preserve and replay forever. Sometimes when I’m coming home from the library late at night, I’ll stand on the Green and stare at Baker Tower and let them wash over me. The “real world” (we say it so ominously) and the future is full of the unknown. After being filled with an endless stream of information for four years, it’s difficult to just “not know.” But not knowing leaves room for curiosity and moments of creation. As Sōtō Zen monk Shunryū Suzuki noted, “In the beginner’s mind there are many possibilities; in the expert’s mind there are few.” We’re all going to be beginners out there, and we have a long way to grow. Just remember to keep emptying your cup.